Experience the Nile River “The Heart of Egypt” for 7 night Nile cruise itinerary from Aswan accompanied by a private Egyptologist tour guide to discover the treasures of ancient Egyptian pharaohs and witness the breathtaking temples and tombs such as Karnak temple, Queen Hatshepsut temple, Valley of the Kings, and other historical monuments in Luxor and Aswan. So don’t hesitate to book your experience now!. Accommodation for 7 nights on board 5 star cruise on full board basis. Egyptologist guide during your tour. 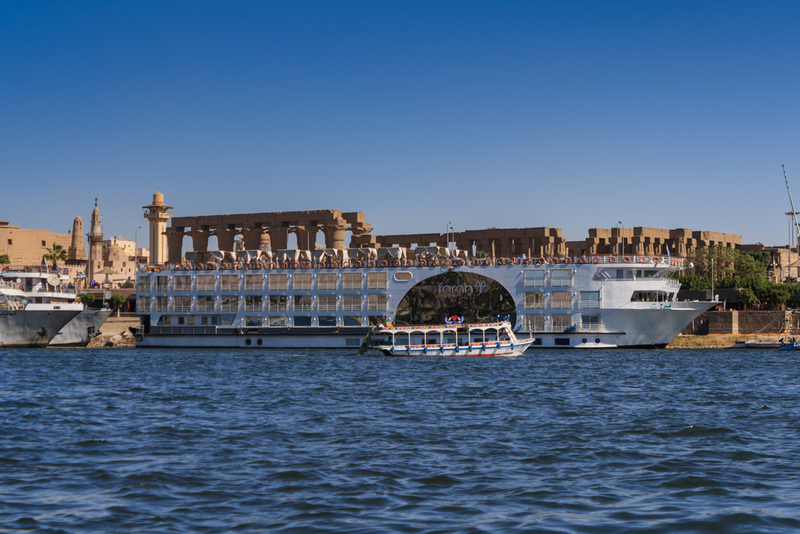 Morning time, you will meet your tour guide to check in 5* deluxe Nile Cruise then, sailing to Kom Ombo and overnight in Aswan. A temple overlooking the Nile. This temple divided into 2 temples with 2 entrances, 2 hypostyle Halls, and 2 sanctuaries it’s will be interesting to visit this historical place. No site in Egypt is more impressive than the Karnak temple. It is the largest temple complex ever built by man and represents the combined achievement of many generations of ancient builders and pharoahs. The Temple of Karnak is actually three main temples, smaller enclosed temples, and several outer temples situated on 247 acres of land. Then back to your Nile cruise to have lunch and relax. Back to your cruise for overnight on board. The final resting place of Egypt’s rulers from the 18th to the 20th dynasty, it is home to tombs including Ramses II and Tutankhamen. The tombs were well stocked with all the material goods a ruler might need in the next world. Most of the decoration inside the tombs still well preserved. One of the most beautiful & best preserved of all of the temples of Ancient Egypt. The temple was built on three levels with two wide ramps in a central position joining the levels together. Two massive stone statues of king Amenhotep III are the only remains of a complete mortuary temple. The statues are made from blocks of quartzite sandstone which existed in Cairo then moved 700 KM to Luxor. Back to your cruise and overnight. Check out after breakfast and transfer to anywhere you want in Aswan to end your experience in upper Egypt.